At the moment, when we have a bunch of people sharing a single charger, it's irritating to have to keep looking at my phone throughout the day to see if I have to go unplug or not. Couldn't agree more - we have 4-5 cars sharing a single level 2 charging station at the office. The Leaf/Volt owners get push notifications or text messages when charging is complete. I'm sitting in my office trying to remember to check status via the iRemote app - seems nonsensical that a market leader would produce such sub-standard s/w solutions. Go figure. My Android BMW i Remote client does just that - pops up notification when the charging is completed. I thought it was annoying, so I turned it off . If you have an Android phone, go to Settings -> Apps -> scroll down to "BMW i Remote" and make sure <Show notifications> is checked. I get updated charging status notification throughout the day with the most recent BMW i App update. And now the BMW Connected (New one) App supports i vehicles. I get percentage updates and time of completion. Very handy. are you using iOS or Andriod? can you explain how you get these notifications?? It works on both Android and iOS. See afadeev's comment above on how to set up notifications. I do not get notifications on my iPhone. I have tried the iRemote app and the BMW connected app. It worked a few times on my 2014 i3 a couple years ago. It doesn’t work on my new 2017 i3 either. The iConcierge said they hoped the next update would help. The local BMW genius said it doesn’t work very well on iOS. I wish it worked. I know another i3 owner that doesn’t get notifications either. afadeev's comments above address setup for Andriod users, not iOS - which is what I'm using, and what I'm asking about. Ok Sorry about that. I'm on Android and I hadn't heard of these problems with iOS. There's no technical reason why notifications can't work reliably under iOS; iOS supports notifications well and many iOS apps use notifications successfully. I have had notifications for the iRemote and Connected apps turned on under recent iOS versions (I always run the most recent version), but I have never received a notification from either app. The lack of notifications under iOS must be due to a bug in the apps or the lack of implementation of notifications in these apps. I have an iphone I use for work, and I went into the settings and enabled notifications. That should send them to me when the car updates, will know tonight, for sure. Does anyone currently receive charging status notifications on iOS (iPhone)? I have not received them for months. I do get notification from ChargePoint and EVgo apps, when using their chargers. BMW has soooooooo many apps now, it's hard to know which one is current, and which is one supposed to have what functionality. None of them notify me of anything. I am wondering about the BMW Connected Drive app. 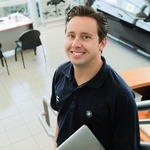 I have called BMW several times and get a different answer each time. 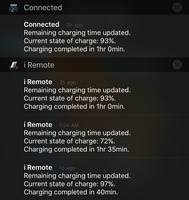 So my question is: Does anyone currently receive i3 charging status notifications on their iPhone from the Connected Drive app?